On Wednesday October 9, Bob White's Karate will present a seminar featuring one of the true legends of karate, Mike Stone. Mr. Stone known for his aggressiveness, earned the nicknamed “The Animal” and compiled a record of 91 consecutive wins. In 1964, Stone won the sparring grand championship at the first ever International Karate Championships in Long Beach. Stone has authored several books, most notably "Mike Stone’s Book of American Eclectic Karate". There will be NO ADMISSION FEE for this seminar. In lieu of an admission, we will accept donations to the Royal Family Kids. Mr. Stone is donating his time for this seminar, so all money raised through donations will be given to the RFK. In addition we will have an autographed poster (see below) that will be auctioned off with the proceeds going to the RFK. The seminar is open to all ranks, organizations and styles. Space is limited so please email bobwhite@bwkenpo.com to reserve your spot. 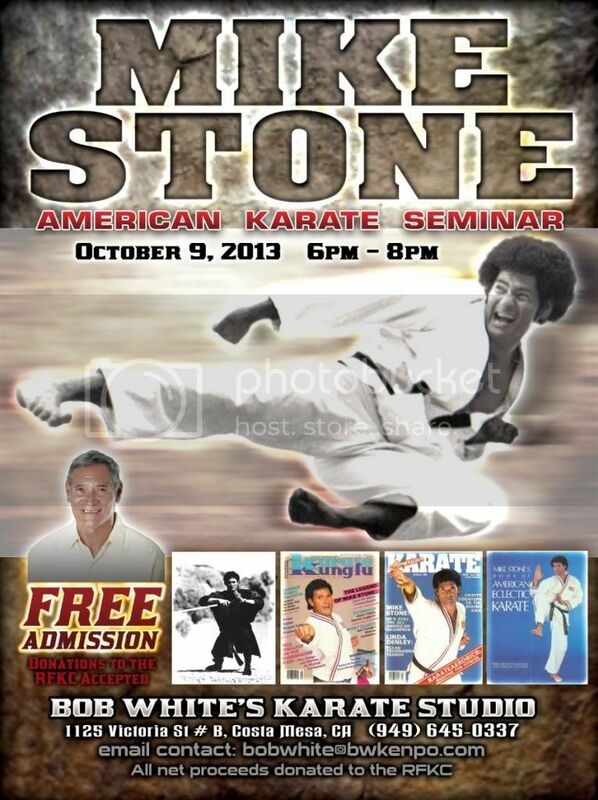 Don’t miss the opportunity to meet and learn from one of the pioneers of American Karate! I'm in Houston, Texas right now attending the opening of the Sports Karate Museum. Gary Lee has spent years putting this dream together and this weekend was the Ribbon Cutting ceremony. Mike Stone flew in from the Philipines to participate in the opening. There are many world champions here and some very well known competitors but nobody receives the attention and respect like Mike Stone. Many people feel that the only way they can be respected is to put on a 10th Degree or have a lofty title. Mike's respect is earned by who he is and his accomplishments. Mike Stone is the closest I have seen to a super star in karate since Mr. Parker passed away. It means a lot to me to have him at our school and I hope people take advantage of this opportunity to meet and train with a real American Karate legend. Mike Stone's Seminar was a great success. I truly like to see win, win, and win situations. Participants won because of the experience and exposure to Mike. Our school won because we had an opportunity to host this great leader and the people who came to support, and the Royal Family Kids won because we raised over $2,000. The donations were generous and the poster sales were well supported. We have 10 signed posters left and we are selling them for $20+tax+shipping so if we make it $30 it will cover all costs. MT: Free Bob White Seminar and other Updates!